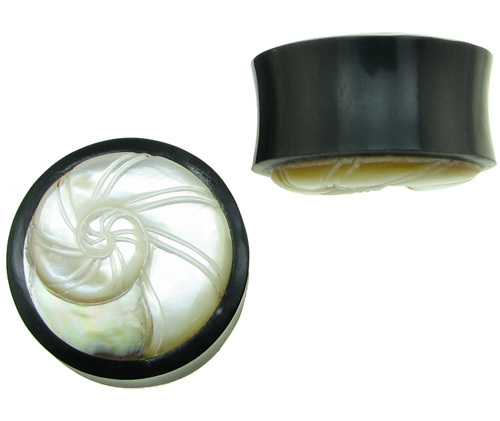 These dark Water Buffalo Horn Double Flared Plugs are inlaid with Mother of Pearl Cabochons carved with Spiral Shell designs. They are unique and eye catching. 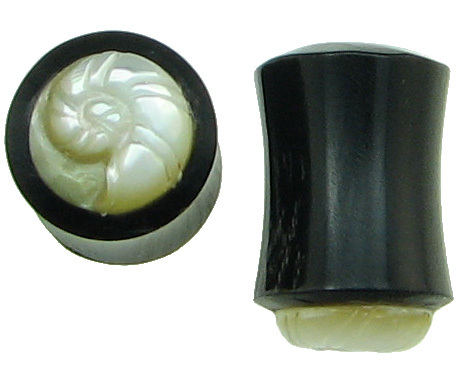 Rather than mass-manufactured, these natural Horn Earring Plugs are made by hand by natural material, so some variation (such as color, texture, size, etc.) is present from piece to piece in a pair and also from the pair shown in this photo. 1 gauge 5/8 inch (+$4.00) 3/4 inch (+$4.00) 7/8 inch (+$4.00) 1 inch (+$8.00) Select your size and click "Add to Cart".